Dispatchers are required by Part 121 for airlines. Supplemental only need flight followers (they don’t require a certificate but most Supplement carriers require one anyway). Part 135 normally have flight followers as well with dispatcher certificates as well, but again, not a Federal Regulation. Dispatchers plan the flight for the pilot. They submit the flight plan to ATC for the pilot. They gather the weather information and NOTAMs and present them to the pilots and factor them into the flight plan. Dispatchers can delay the flight as well. During the flight, they monitor its progress and issue necessary information for the safety of flight, and either cancel the flight or redispatch if it cannot be continued safely as planned. They give updated weather before landing. If the flight needs to go to an alternate airport, they make sure the airport is ready for the flight and also help the pilots decide which airport to divert to. 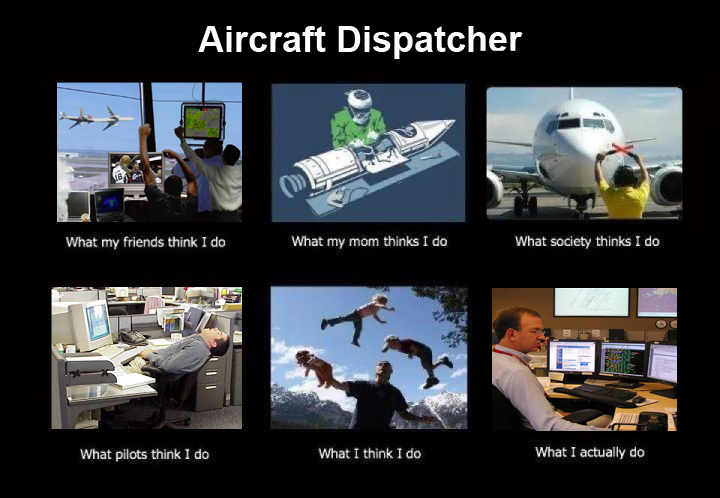 How do I become an aircraft dispatcher? You need to attend an FAA certified school and receive 200 hours of instruction. Unlike pilot training where it’s mostly individual, you will be in a class with other people. You will still take a written exam and a “checkride” involving an oral and a practical exam. Here is a list of approved schools by the FAA. So getting your Aircraft Dispatch Certificate is like getting your ATP? The written exams pull from the same question bank currently, but that’s where that similarity ends. Getting the rest of your certificate involves class time and focuses HEAVILY on Federal Aviation Regulations (FARs), weather theory, applying weather information to flight planning, and flight planning/weight & balance calculations. What can I expect when earning my Aircraft Dispatcher Certificate? Lots of hard work! You need to thoroughly understand lots of subjects pilots can get away with only half-knowing. Weather was difficult for me, but I had to take the time and learn it. It depends on what type of school you go to as well. There are the traditional 5-6 week course with 40 hours of class each week, which is like drinking from a fire hose. I went to a distance learning course, I spent from March-June doing the online content, 2-5 hours every day to do it. You have to be extremely motivated. Then I went for 6 days of classes, 10 hours of class each day. You take your checkride at the end of it with an examiner. How do you do a long distance or shorter course? Lots of hard work again! Some schools require Part 121 experience or military experience in accordance with the FARs. A lot have online portions that count towards the hours as well. I went into this with only my Private Pilot, which meant I had a lot to learn. I went out of my way to learn more about instrument procedures (I used Gleim books and the FAA books that weren’t on the course syllabus) and also I knew nothing about turbine systems when I went to study the Boeing 737-300 so I went to the Turbine Pilot’s Flight Manual, again not assigned. You have go out of your way to learn if you want to do this type of course. Like your PPL, this certificate doesn’t expire. You only have a currency requirement if you work for an airline. They are required to give you 20 hours of recurrent training plus 5 hours of flight deck observation. (Yeah, that means you get to jumpseat!) If you get this certificate and you don’t use it. You always have it, but if you don’t keep up on your knowledge when you apply to work at an airline you’ll probably fail their test and interview. Why become an Aircraft Dispatcher? This is a personal question. For me, I wanted to be in aviation but didn’t want to spend years and thousands and thousands of dollars earning my flight ratings. I wanted to have a job that opened me up to have time and money to fly for fun (granted it’ll take a bit to earn some “good” money) but I won’t be stuck at the regionals as long as pilots are most likely and I get to be home every night. I love flight planning, I found that out during my PPL so took it a few levels up! If you have any more questions, feel free to comment on this post and I’ll add it! I hope this helps some people decide if they want to go down this route! Good and very informative article about aircraft dispatcher.